The $700,000, Institute of Medicine performance study of the $3 billion California stem cell agency is expected to be released in late November or early December, the IOM said today. In response to a question last week from the California Stem Cell Report, Christine Stencel, senior media relations officer for the IOM in Washington, D.C., briefly discussed the release plans and the impact of the East Coast super-storm. The stem cell agency is paying for the report, which is examining the performance of the agency. The IOM began its work in the summer of 2011. Geron, Inc., of Menlo Park, Ca., said today it is assessing an offer by two of its former executives to buy the human embryonic stem cell program that it abandoned nearly a year ago. Geron startled the stem cell world, including the $3 billion California stem cell agency, when it jettisoned the first clinical trial of an hESC therapy for financial reasons. The agency had loaned the company $25 million just a few months earlier. Geron repaid the loan with interest. Geron has been mum until today about the Oct. 18 offer by Biotime, Inc., of Alameda, Ca., which is headed by Michael West, who founded Geron in 1990. Tom Okarma, president of Geron from 1999 to 2011, is involved with West on the deal and is now working at Biotime. The spokesman declined to offer any additional comments on the Biotime proposal when questioned following his initial statement. See here and here for earlier stories on the California Stem Cell Report on the Biotime offer. A British investment trust that has invested in Geron says it is going to take an advantage of an offer by an Alameda firm that is seeking to acquire Geron's human embryonic stem cell assets. Jonathan C. Woolf, managing director of British & American Investment Trust PLC, said last week in a letter to its shareholders that it is disappointed in Geron's performance and the abandonment of its hESC program last November. The sudden halt to the program and its historic clinical trial also surprised the California stem cell agency, which had loaned Geron $25 million just a few months earlier. The agency has expressed an interest in continuing the trial. Woolf's trust is not listed as a major Geron shareholder by Morningstar, but Woolf said 17 percent of his firm's investments are in the Menlo Park, Ca., company. The specific size of the trust's holdings in Geron was not immediately known. Woolf urged Geron directors and other Geron shareholders to work with Biotime to complete the deal. Geron has not commented on the offer. BURLINGAME, Ca. – For the first time, a Big Pharma company has hooked into the $3 billion California stem cell agency, a move that the agency described as a “watershed” in its efforts to commercialize stem cell research. The stem cell agency's award triggered arrangements between ViaCyte and Glaxo that will bring in financial and other support from Glaxo. The exact amount of cash was not disclosed. CIRM said Glaxo will “co-fund and, assuming success, conduct the pivotal trial and commercialize the product.” Under the terms of the grant, Glaxo and ViaCyte will have to meet CIRM milestones in order to secure continued funding. Gardner credited CIRM President Alan Trounson with being instrumental in helping to put the arrangement together, beginning with their first meeting three years ago. Trounson said the deal will resonate not only in California but throughout the world. In comments to the California Stem Cell Report, Elona Baum, CIRM's general counsel and vice president for business development, described the award as a “watershed” for the eight-year-old agency, linking the agency with Big Phama for the first time. Much of CIRM's current efforts are aimed at stimulating financial commitments from large companies, which are necessary to commercialize stem cell research. Arrangements between Big Pharma and small companies are not unusual and can vanish quickly. However, the CIRM-ViaCyte-Glaxo deal sends a message to other Big Pharma companies and smaller ones, perhaps clearing away concerns that have hindered other deals that could involve the stem cell agency. The stem cell agency is pushing hard to fulfill the promises of the 2004 ballot campaign that created CIRM. Voters were led to believe that stem cell cures were virtually around the corner. None have been developed to date. BURLINGAME, Ca – Directors of the California stem cell agency this morning approved $19.5 million in awards to two companies for research aimed at completing an early stage clinical trial within four years. The awards are part of the agency's push to commercialize stem cell research and engage industry more closely. All of the six applicants came from industry. However, the firms that were turned down were not identified with the exception of Athersys, Inc., of Cleveland, Ohio. CIRM Director Steve Juelsgaard asked for a discussion of an appeal by Athersys, Inc., of Cleveland, Ohio, whose application was rejected by reviewers who scored it at 60 out of 100. The two winners had scores of 88 and 73. .However, following a brief look at the application, the board rejected Athersys' application along with other proposals turned down by reviewers. .
Click on this link for the CIRM press release on the awards. BURLINGAME, Ca. -- The president of the $3 billion California stem cell agency, Alan Trounson, will be working half-time while living in Australia during January and February of next year. Trounson told the governing board of the agency of his plans at the beginning of its meeting here morning. He said he needs to spend more time with his family, which lives in Melbourne. Trounson has an 11-year-old son with whom Trounson said he hasn't spend much time in the last 18 months. Trounson said he intends to teach his son to surf. Trounson's daughter also will be getting married in February. Meanwhile, directors are currently discussing approval of grants in its $20 million-plus strategic partnership round. One of the co-founders of Athersys, Inc., of Cleveland, Ohio, is attempting to overturn reviewer rejection of his company's application for an $8.3 million award from the California stem cell agency to assist in a clinical trial for a therapy for stroke victims. A document from Mays that CIRM released said reviewers' objections could be addressed by “information that may not have been adequately conveyed at the time or with new information that has since become available.” The document laid out several “recent” studies that it said supported its pitch for funding in a phase two clinical trial. CIRM's review summary also raised the question of how much of the work would be done in California. The stem cell agency is limited to funding research in California. The Athersys application came in CIRM's first strategic partnership round. Two out of six applications were approved by reviewers. The winners, whose identities are being withheld until tomorrow by the stem cell agency, received scores of 88 and 73. The scores of the other applicants and their identities were also withheld by the agency. The Athersys appeal will come before the CIRM governing board at its meeting tomorrow in Burlingame, Ca. OAKLAND, Ca. – Meeting against a backdrop from Texas that involves conflicts of interest and mass resignations of grant reviewers, a task force of the $3 billion California stem cell agency today began a partial examination of its own grant approval process, specifically focusing on appeals by rejected applicants. The situation in Texas involves the five-year-old Cancer Prevention and Research Institute, which like the California stem cell agency, formally known as the California Institute of Regenerative Medicine (CIRM), has $3 billion of borrowed money to use to finance research. The situation in Texas came to a head AFTER the governing board of the California research group created its task force. The problems in Texas are bigger and not identical to those in California, which mainly involve the free-wheeling nature of the appeal process, not an entire lack of scientific review. Nonetheless, this past summer, directors of the California agency for the first time approved an award that was rejected twice by reviewers. The award went to StemCells, Inc., of Newark, Ca., which now has won $40 million, ranking the company No. 1 in awards to business from CIRM. Today's session of the CIRM task force focused primarily on an aspect of the agency's appeals process that CIRM labels as “extraordinary petitions.” They are letters which rejected applicants use to challenge decisions by grant reviewers. The researchers follow up with public appearances before the governing board, often trailing squads of patients making emotional appeals. Both researchers and patients have a right under state law to appear before the CIRM board to discuss any matter. CIRM, however, is trying to come up with changes in the appeal process that will make it clear to researchers on what the grounds the board might overturn reviewers' decisions. The agency is also defining those grounds narrowly and aiming at eliminating appeals based on differences in scientific opinion. It was a sentiment that drew no dissent at today's 90-minute meeting. Missing from today's meeting, which had teleconference locations in San Francisco, Irvine, La Jolla and Palo Alto, were any of the hundreds of California scientists whose livelihoods are likely to be affected by changes in the grant approval process. Also absent were California biotech businesses, along with the only representative on the task force from CIRM's scientific reviewers. Our comment? When researchers and businesses that have millions at stake fail to show up for key sessions that set the terms on how they can get the money, it is a sad commentary on their professional and business acumen. Biotime, Inc., and two men who were leading players in history of Geron Corp. today made a surprise, public bid for the stem cell assets of their former firm. The men are Michael West and Thomas Okarma. 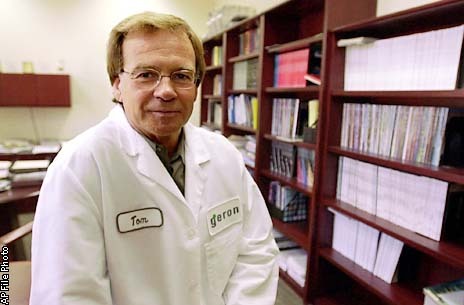 West founded Geron in 1990 and was its first CEO. West is now CEO of Biotime. Okarma was CEO of Geron from 1999 to 2011. Okarma joined Biotime on Sept. 28 to lead its acquistion efforts. Both Geron, based in Menlo Park, Ca., and Biotime, based in Alameda, Ca., are publicly traded. West and Okarma sent an open letter this morning to Geron shareholders and issued a press release making a pitch for the Geron's stem cell assets. Geron jettisoned its hESC program nearly a year ago and closed its clinical trial program for spinal injuries. The move shocked the California stem cell agency, which just a few months earlier had signed an agreement to loan the firm $25 million to help fund the clinical trial. The portion of the loan that was distributed was repaid with interest. At the time, Geron said it would try to sell off the hESC program, but no buyers have surfaced publicly. Personnel in the program have been laid off or found employment elsewhere. The letter asked Geron shareholders to write the firm's board of directors to urge them to approve the offer. Geron had no immediate response to the proposal. Asked for comment, Kevin McCormack, spokesman for the California stem cell agency, said the deal “had nothing to do with us.” However, in the past, CIRM has indicated that it could find a way to transfer the loan to an entity that would continue spinal injury clinical trial. CIRM President Alan Trounson was also involved at one point in trying to assist in a deal. Geron's shares rose 12 cents to $1.54 today while Biotime's shares lost four cents to $3.95. Here are links to the two news stories that have appeared so far on the proposed deal: Associated Press, Marketwatch. Directors of the California stem cell agency are set to give away $20 million next Thursday and authorize a handsome addition to their signature disease team effort, bringing its total to $543 million. It is all part of the $3 billion agency's push to develop therapies prior to running out of money for new grants in 2017. CIRM reviewed six applications with two winning approval. The agency's governing board is expected to ratify the decision next week. None of the applicants have been identified by the agency, which routinely withholds that information prior to board action even when applicants have identified themselves. Addition of a new $100 million disease team round will come on top of the second, $213 million disease team awards approved last this summer. The first round, awarded in 2009, totaled $230 million. The size of the new round could be altered by CIRM directors prior to approval. Also before the board is a $40 million proposal to expand the industry-friendly strategic partnership effort into a second round. The thrust of the disease team effort is to speed the process of establishing clinical trials and to finance efforts that might founder in what the biotech industry calls a valley of death – a high risk financial location, so to speak, where conventional financiers fear to tread. The new disease team round will require “co-funding” from applicants but the agency did not specify what it means by the term. The matter of matching funds has become an issue in awards to StemCells, Inc., of Newark, Ca., in this summer's disease team round. Next week's agenda additionally contains a plan to tighten review of proposed research budgets in grant applications, making it clear that CIRM staff will be negotiating such matters even after the board approves grants and loans. So far no researchers have testified in public on the budget plan although it could well have a significant impact on their future efforts. Additional matters will discussed as well at the meeting in Burlingame, which also has a teleconference location in La Jolla that will be open to the public. The address and additional material can be found on the agenda. Hiltzik noted that StemCells, Inc., now ranks as the leading corporate recipient of cash from the agency with $40 million approved during the last few months. But he focused primarily on September's $20 million award, which was approved despite being rejected twice by grant reviewers – “a particularly impressive” performance, according to Hiltzik. It was the first time that the board has approved an award that was rejected twice by reviewers. The two are Robert Klein, who led the ballot campaign that created the agency and became its first chairman, and Irv Weissman of Stanford, who co-founded StemCells, Inc., and sits on its board. 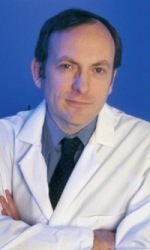 Weissman, an internationally known stem cell researcher, also was an important supporter of the campaign, raising millions of dollars and appearing in TV ads. Klein, who left the agency last year, appeared twice before the CIRM board this summer to lobby his former colleagues on behalf of Weissman's company. It was Klein's first appearance before the board on behalf of a specific application. CIRM board approval of the $20 million for StemCells, Inc., came on 7-5 vote that also required the firm to prove that it had a promised $20 million in matching funds prior to distribution of state cash. “The problem is that StemCells doesn't have $20 million in spare funds. Its quarterly report for the period ended June 30 listed about $10.4 million in liquid assets, and shows it's burning about $5 million per quarter. Its prospects of raising significant cash from investors are, shall we say, conjectural. “As it happens, within days of the board's vote, the firm downplayed any pledge 'to raise a specific amount of money in a particular period of time.' The idea that CIRM 'is requiring us to raise $20 million in matching funds' is a 'misimpression,' it said. Indeed, it suggested that it might count its existing spending on salaries and other 'infrastructure and overhead' as part of the match. StemCells declined my request that it expand on its statement. “CIRM spokesman Kevin McCormack says the agency is currently scrutinizing StemCells' finances 'to see what it is they have and whether it meets the requirements and expectations of the board.' The goal is to set 'terms and conditions that provide maximum protection for taxpayer dollars.' He says, 'If we can't agree on a plan, the award will not be funded.'" “The agency shouldn't be deciding on the spot what does or doesn't qualify as matching funds. It should have clear guidelines in advance. The move by the $3 billion California stem cell agency to curtail its free-wheeling grant appeal process will undergo its first public hearing next week. The proposals will mean that scientists whose applications are rejected by reviewers will have fewer avenues to pursue to overturn those decisions. The changes could take effect as early as next year. In addition to alterations in the appeal process, the CIRM directors' Application Review Task Force will take up questions involving “ex parte communications.” The agenda for the Oct. 24 meeting did not contain any additional information on the issue but it likely deals with lobbying efforts on grants outside of public meetings of the agency. We understand that such efforts surfaced last summer involving the $$214 million disease team round and Robert Klein, the former chairman of the stem cell agency. Klein appeared twice publicly before the board on one, $20 million application by StemCells, Inc., the first time a former governing board member has publicly lobbied his former colleagues on an application. The application was rejected twice by reviewers – once on the initial review and again later on a re-review – but it was ultimately approved by directors in September on a 7-5 vote. The board has long been troubled with its appeal process but last summer's events brought the matter to a new head. The issue is difficult to deal with because state law allows anyone to address the CIRM governing board on any subject when it meets. That includes applicants who can ask the board to approve grants for any reason whatsoever, not withstanding CIRM rules. The board can also approve a grant for virtually any reason although it has generally relied on scientific scores from reviewers. The proposals to restrict appeals are designed to make it clear to scientists whose applications are rejected by reviewers that the board is not going to look with favor on those who depart from the normal appeals procedure. While the board almost never has overturned a positive decision by reviewers, in nearly every round it approves some applications that have been rejected by reviewers. That has occurred as the result of appeals and as the result of motions by board members that did not result from public appeals. Ten of the 29 board members are classified as patient advocates and often feel they must advance the cause of the diseases that they have been involved with. Sometimes that means seeking approval of applications with low scientific scores. “A material dispute of fact should meet five criteria:(1) An applicant disputes the accuracy of a statement in the review summary;(2) the disputed fact was significant in the scoring or recommendation of the GWG(grant review group); (3) the dispute pertains to an objectively verifiable fact, rather than a matter of scientific judgment or opinion;(4) the discrepancy was not addressed through the Supplemental Information Process and cannot be resolved at the meeting at which the application is being considered; and (5) resolution of the dispute could affect the outcome of the board’s funding decision." “New information should: (1)be verifiable through external sources; (2) have arisen since the Grants Working Group(grant review group) meeting at which the application was considered; (3) respond directly to a specific criticism or question identified in the Grants Working Group’s review; and (4) be submitted as part of an extraordinary petition filed five business days before the board meeting at which the application is being considered." Next week's hearing is scheduled for Children's Hospital in Oakland with a teleconference location at UC Irvine. Addresses can be found on the agenda. More than one back story exists on Shinya Yamanaka and his Nobel Prize, but one that has received little attention this week also raises questions about hoary practice of peer review and publication of research – not to mention the awarding of billions of dollars in taxpayer dollars. The Yamanaka tale goes back to a 2010 article in the New Scientist magazine by Peter Aldous in which the publication examined more than 200 stem cell papers published from “2006 onwards.” The study showed an apparent favoritism towards U.S. scientists. Also specifically reported were long delays in publication of Yamanaka's papers, including in one case 295 days. “All's fair in love and war, they say, but science is supposed to obey more noble ideals. New findings are submitted for publication, the studies are farmed out to experts for objective 'peer review' and the best research appears promptly in the most prestigious journals. “Triggered by this protest, New Scientist scrutinised the dynamics of publication in the most exciting and competitive area of stem cell research, in which cells are 'reprogrammed' to acquire the versatility of those of an early-stage embryo. In this fast-moving field, where a Nobel prize is arguably at stake, biologists are racing feverishly to publish their findings in top journals. “Our analysis of more than 200 research papers from 2006 onwards reveals that US-based scientists are enjoying a significant advantage, getting their papers published faster and in more prominent journals (find our data, methods and analyses here). At the $3 billion California stem cell agency, peer review is undergoing some modest, indirect examination nowadays. The agency is moving towards tighter scrutiny of budgets proposed by applicants. And, following a record wave of appeals this summer by disgruntled applicants rejected during peer review, it is also moving to bring the appeal process under more control. As the agency tries to move faster and more successfully towards development of commercial therapies, it may do well to consider also the frailties of its peer review process and the perils of scientific orthodoxy. This week's announcement of the Nobel Prize for Shinya Yamanaka brought along some interesting tidbits, including who was “snubbed” as well as recollections from the recipient. Jon Bardin of the Los Angeles Times wrote the “snubbed” piece and quoted Christopher Scott of Stanford and Paul Knoepfler of UC Davis about the selection issues. Bardin's piece mentioned Jamie Thomson and Ian Wilmut as scientists who also could have been considered for the award but were not named. Ultimately, Bardin wrote that the award committee was looking for a “singular, paradigm shifting discovery,” which he concluded was not the case with Thomson or Wilmut. How Yamanaka arrived at his research was another topic in the news coverage, much of it dry as dust. However, Lisa Krieger of the San Jose Mercury News began her story with Yamanaka's travails some 20 years ago. At the time, no one was returning his phone calls as he looked for work, and he was rejected by 50 apparently not-so-farsighted American labs. But that job search in 1993 came only after Yamanaka decided he was less than successful as an orthopedic surgeon, according to an account in JapanRealTime. “Slow and clumsy” was how Yamanaka described himself. And so he moved on to research. But again he reported stumbling. In this case, he found a way to reduce “bad cholesterol” but with a tiny complication – liver cancer. That in turn sent him on a journey to learn how cells proliferate and develop, which led him to the work that won the Nobel Prize. SAN FRANCISCO – A move to tighten budget controls on grants from the $3 billion California stem cell agency stalled Monday, but it appears that the plan is headed for ultimate approval. The proposal was up for consideration by the agency's directors' Science Subcommittee, which could not act on it after it lost its quorum. Members of the panel generally favored the stronger budget controls, but had questions about the specifics of implementing the plan during closed-door reviews of grant applications. The proposal is likely to be altered to respond to those concerns. It would then either come back to the Science Subcommittee or go to the full board. The plan would make it clear to recipients of large grants that approval of an application by the agency's governing board does not provide a carte blanche to researchers. Ellen Feigal, senior vice president for research and development, said it can be “extremely difficult” for CIRM staff to deal with budget problems in grants following board approval. The committee also approved a plan to speed the application process on its next disease team round, which is aimed at driving research into the clinic. The concept proposal for that round is scheduled to come before directors later this month. The round will be limited to “more mature stage” research that is close to a clinical trial, if not in one. Feigal said 10 to 15 applications are expected. Another proposal to add more millions to CIRM's strategic partnership program was also approved. The iPierian biopharmaceutical company in South San Francisco was quick to make a change in its web site this morning after the Nobel Prize for medicine was announced. Altered was the bio for one of its scientific advisors, Shinya Yamanaka, to note that he had won the Nobel. The bio is tucked away on the site, but it is likely that the company, which specializes in iPS work, will figure out how to put the news out front on its home page as well as issue a press release. It was all part of the reaction today in California to the Nobel for Yamanaka, who has substantial links to the Golden State, including UCSF and the Gladstone Institutes. Both enterprises moved with greater deftness than iPierian. Yamanaka is a professor at UCSF and a senior investigator at Gladstone, and the organizations quickly put together a news conference this morning that featured Yamanaka on a video hook-up from Japan. One of the recipients of CIRM's iPS cash is the well-connected iPierian, which has taken in $7.1 million. Yamanaka, however, has never received a grant from the agency, and it is not known whether he ever applied since CIRM releases only the names of researchers whose applications were approved. Going against the grain can be difficult as UC Davis stem cell scientist Paul Knoepfler learned again in connection with his research that dealt with similarities between cancer and iPS cells. As many readers know, iPS or reprogrammed adult cells are currently a hot research avenue in stem cell research because they avoid many of the ticklish ethical and political problems connected with human embryonic stem cells. “Once we had a manuscript together comparing iPS cells to cancer cells, we sent it to several high profile journals without much luck. We thought that the fact that our data indicated that iPS cells are similar to cancer cells might make reviewers and editors excited. We thought that the paper was novel and thought provoking in a number of ways. At the same time I realized the theme of the paper would be controversial. Knoepfler's item and similar comments from other researchers that can found elsewhere on the Internet indirectly raise questions about the California stem cell agency's process of peer review of applications for hundreds of millions of dollars in funding, especially in the wake of this summer's unprecedented rash of appeals of decisions by grant reviewers. The key question is whether the agency's closed-door process reinforces orthodoxy or, in fact, is all but controlled by what amounts to scientific conventional wisdom. Obviously, no researcher likes to see a paper rejected or a grant denied. But the record number of appeals at CIRM and other private complaints could well indicate that potentially profitable proposals are receiving a less than welcome reception behind closed doors from agency reviewers. The agency's board itself is hard-pressed to make such determinations. It is hamstrung by procedures that do not permit it to expand an application directly – only a staff-written summary. Names of applicants and institutions are censored, although the board is required by law to discuss in public most aspects of a research proposal. Exceptions are permitted for proprietary information. Additionally, a handful of the 29 members of the governing board do participate in the reviews, which come before final action by the board. Currently the agency is pushing hard to commercialize stem cell research and fulfill at least some of the promises to voters that were made in 2004. To do that, the agency may well have to step outside of the normal comfort zone of the good burghers of stem cell science. Some of California's top stem cell researchers are going to have to sharpen their spreadsheets if they want to win money from the state's $3 billion stem cell agency. The agency is moving to beef up scrutiny of the high-profile, big-ticket grant applications that it will consider during the next several years. The effort may well extend to all grant programs. The move also makes it clear to researchers that the CIRM staff is in the driver's seat when it comes to budgeting on research projects. The proposal comes before the CIRM directors' Science Subcommittee next Monday and would alter the closed-door grant review process in the following manner, according to Feigal's memo. • “To assist GWG review, appropriate expertise on budget and financial matters (e.g., this could be in the form of a specialist reviewer, or can also be assigned to a GWG reviewer with the appropriate background and expertise), will review applications for sound budgeting and provide comments or questions to the GWG for consideration by the reviewers before the reviewer’s final scores are entered. • “If the financial/budgetary matter potentially directly impacts on the design or feasibility of conducting the project, the GWG may consider this issue in the scoring; otherwise, budgetary and financial issues and questions will not contribute to the scientific score. • “As appropriate, review summaries sent to the ICOC (the CIRM governing board) will identify scientific as well as budget or other issues. To the extent endorsed by the GWG, the review summaries will also identify potential resolution should the ICOC approve a given award with budget issues. The agency has already examined some budgets prior to board approval. One grant review in a $200 million-plus round this summer, for example, declared that costs to prepare regulation packages had “overlap” and were “excessive,” along with costs dealing with manufacturing and per patient expenses. That was for a high-scoring application by Antoni Ribas of UCLA, and he was not alone. • “Budget does not align with the program deliverables and milestones. For example, the budget includes activities not relevant to project objective(s) or that are out of scope. •”Budget does not contain adequate expenses for known costs. For example, an applicant may budget $100,000 for a GMP manufacturing run of a biologic in which it is generally accepted knowledge that the actual expenses are typically much greater. •“Budget item significantly exceeds a known cost or seems excessive without adequate justification. For example, an applicant may propose a surgical expense of $100,000 per patient for a procedure with Medicare reimbursement set at $15,000. Our take: This seems to be a well-advised move, albeit one that is not likely to find favor with researchers accustomed to loose oversight. It moves budgetary review to an earlier stage and gives the CIRM directors a chance to weigh in on those matters prior to approval of grants, instead of creating a sense of entitlement on the part of recipients that may pop up following board approval of their applications. Indeed, the plan makes such good sense that it raises the question why it was not in place years ago. A final note: Feigal's memo is an excellent example of the type of information that clarifies issues and helps CIRM directors make the best possible decisions. It provides some history, good evidence for a change and an explanation of benefits. Additionally, the memo is timely, having been posted on the CIRM website sufficiently in advance of next week's meeting to give affected parties and others time to comment and make constructive suggestions. The memo is also far superior to the Power Point presentations that are often submitted to the board minus any nuanced, written discussion of the issue at hand. Next week's meeting will be based in San Francisco but also has teleconference locations in Irvine (2), La Jolla, Stanford, Pleasanton, Oakland and Los Angeles where the public and researchers can participate. The specific addresses can be found on the agenda. UC Davis researcher Paul Knoepfler is the rare stem cell scientist who blogs about his work as well as writing about issues in the field. “So what does this mean in the big picture? “I believe that iPS cells and cancer cells are, while not the same, close enough to be called siblings. As such, the clinical use of iPS cells should wait for a lot more study. Even if scientists do not use iPS cells themselves for transplants, but instead use differentiated derivatives of iPS cells, the risk of patients getting malignant cancers cannot be ignored. “At the same time, the studies suggest possible ways to make iPS cells safer and support the notion of reprogramming cancer cells as an innovative new cancer therapy. The UC Davis press release on the research, which was financed by the California stem cell agency and the NIH, was picked up by several online sites, including Redorbit, Medicalexpress and geekosystem.